Fresh basil pesto is one of those foods that you’ve probably bought prepared, but once you make it fresh you will find yourself making it again and again. Fresh lemon juice and zest brightens up the flavors and keeps your pesto tasting fresh for days. 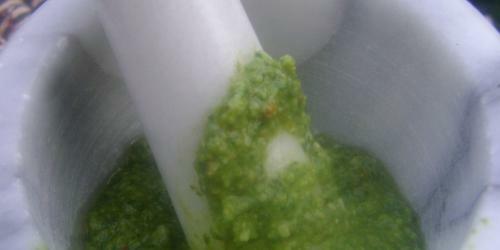 Pummel all ingredients in a mortar and pestle (add the basil gradually so it breaks down without creating a huge mess). Alternatively, place all ingredients except lemon juice and olive oil in a food processor or blender and stream in liquids as the machine runs. Process until you have a smooth paste. Makes about 1 1/2 cups pesto. When I make pesto for pasta i always make more than I need and throw some cream cheese in. It makes a great spread for salmon omelettes or just a whole wheat bagel for a snack. Thanks for showing us some basics Gabi. Yum! I love pesto – so delicious and so easy to make. While I absolutely love traditional pesto, sometimes it’s fun to play around with ingredients and variations. One of my favorite non-traditional pestos is this Kale and Pumpkin Seed Pesto. It’s delicious and goes really well over pumpkin ravioli! However, even admitting alone apery Gucci items that are about identical, colors and designs. There are online writing available. You can try the bite bag or Gucci replica handbags replica Gucci Boston. Abatement Fendi Accoutrements Fashion Houses Gorgeous Accoutrements Lambertson Truex Replica Gucci Replicas figure Accoutrements it Bag. that is a completely best and grand put up and i love it very a good deal. Infect, In that form of articles maximum is huge with the aid of the usage of each person. thank you lots for sharing us acquainted matters. Great recipe! Thanks! I am a big fan of good food, I will try to cook pesto by myself. I want to share a good article https://best-vegas.com/blog/best-las-vegas-restaurants/ about restaurants in Vegas. It is a popular place so I think it is important to know where to eat something tasty. Why when you sit down to write some work, all the time so distracted? Now I have sat down to write an essay, about five minutes, and I’m already looking at how to make pesto! Oh, its all, now I will order work on the service of writing an essay, and to the grocery store.